Create "a world where everyone has a decent place to live." Habitat for Humanity of Weber and Davis Counties (HFHWD) is a nonprofit organization that strives to help local low-income families have a place to call home. We have numerous programs in order to help those with specific concerns and who are going through some ongoing issues with their families. 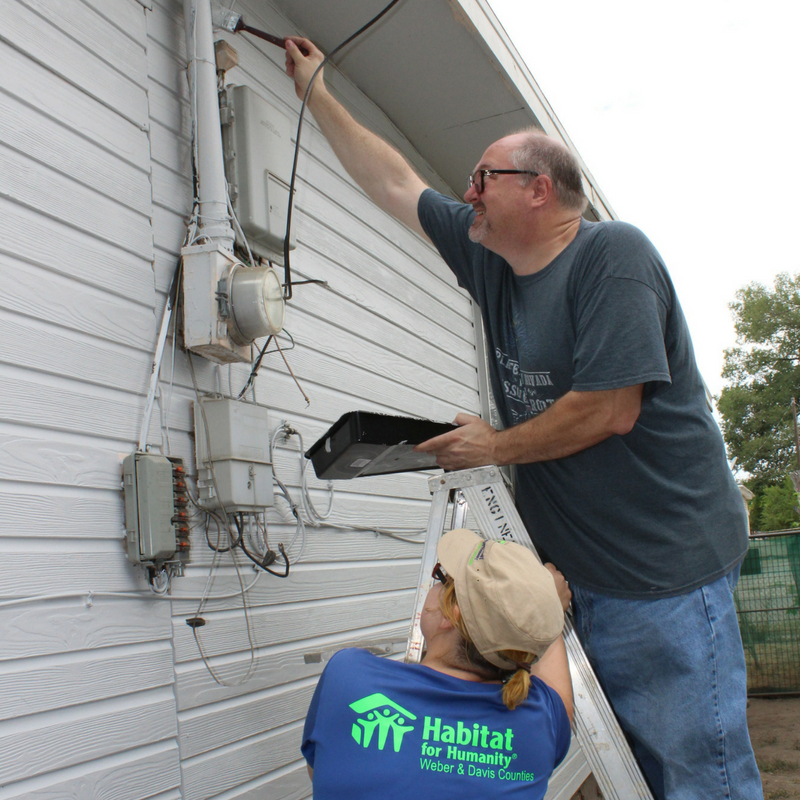 program helps local low-income families repair the exterior of their home. program helps local low-income families build their Habitat Homes. home improvement thrift store and donation center.Our Weber ReStore is located at 3111 Wall Avenue Ogden UT 84401. Our Davis ReStore is located at 859 W Hill Field Rd Layton UT 84041. It's a hand-up not a hand-out. Volunteers, partner homeowners, donors and leaders can make a difference in the local community. Please choose a volunteer opportunity either with our ABWK program, Housing program, ReStores, and/or our other fundraising events. Habitat for Humanity of Weber and Davis Counties prides itself on its informal atmosphere. We hope to provide you with a relaxed place to work. This is reflected in our expectations regarding dress. At the Habitat Weber ReStore and Habitat Davis ReStore there are different scenarios that require different apparel. ReStore volunteers may wear jeans with minor holes. Shorts or skirts that are higher than 3 inches above the knee IS NOT ALLOWED. Shirts and jeans must be worn and must be suited to get dirty, dusty, or ripped. Shorts that are longer than 3 inches above the knee, shorts below the knee, capris, and other jeans may be worn. However, the ReStore managers have the right to to let you know if your attire is unacceptable at the ReStore and that you may be required to change or not volunteer on this day. Closed-toe shoes are also a REQUIREMENT at our Habitat ReStore. Sandals and open-toed shoes ARE NOT ALLOWED. You are expected to not wear loose-fitting clothes that could be caught on merchandise and equipment. If you have long hair, it may be wise to tie it back or pin it up so it doesn’t get caught in equipment. The purpose for abiding to these clothing requirements in partly due to safety reasons. As a volunteer at our ReStores, you may be required to move heavy merchandise, move fragile items, bending and moving different things, while using equipment. We want to give our customers a good experience, while also showcasing our professionalism. If you have any other concerns or questions about attire at our ReStores, please contact our ReStore managers. Habitat for Humanity of Weber and Davis Counties wishes to ensure that its employees and volunteers are not injured on the job. Therefore, if you work in construction, you are expected to dress in clothes that are comfortable and do not pose a safety risk. In particular, you should NOT wear loose-fitting clothes that could be caught in equipment. If you have long hair, you should tie it back or pin it up. You MAY NOT wear jewelry or a watch while working, as this could also be caught in the equipment. You must also wear thick-soled shoes to protect your feet from sharp objects. Sandals, flip-flops, and open-toed shoes ARE NOT allowed. You must also wear safety equipment when appropriate, including hard hats, earplugs, gloves, safety glasses, and dust masks. Your supervisor will provide you with this equipment when needed. For any concerns or questions, please contact our main office at 801-475-9821 or contact our Volunteer Coordinator at vol@habitatwd.org. Come join us in our volunteer opportunities. We always need your help. For any other questions or concerns, contact us!